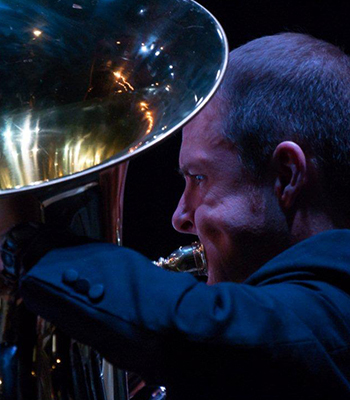 Neal Campbell is Principal Tuba for the Michigan Philharmonic and Dearborn Symphony Orchestra and tubist for the Gabrieli Brass Quintet. He has been on the faculty at universities in Michigan and Ohio, The Blue Lake Fine Arts Camp, and The University of Michigan All-State Program. Neal has performed with the Detroit Symphony Orchestra, Motorcity Brass Quintet, Detroit Chamber Winds, Fischer Theatre Orchestra, Fox Theatre Orchestra, The River City Brass Band, Toledo Symphony Orchestra, Toledo Symphony Concert Band and Michigan Opera Theatre Orchestra. As a B&S Perantucci Tuba Artist, he has been a guest artist at regional, national and international music conferences and festivals. Neal is also a certified flight instructor and commercial pilot.